The Olympic equestrian competitions are broken down into three disciplines; dressage, jumping and eventing. Dressage is the presentation of the horse’s walk, trot and canter, as well its ability to comprehend the commands from its rider to perform a series of prearranged movements in a particular order. In the jumping competition, the rider and his horse try to clear every obstacle in a specified amount of time without recording any faults. Eventing measures overall horsemanship, involving jumping, dressage and cross-country events. There is an individual and team event for each discipline and there is no separation of genders (men and women compete in same competitions) as there is for most other Olympic sports. European nations like Germany, Sweden, France and Great Britain have typically dominated the Olympic equestrian events over the sport’s history, with the exception of the US, who is second all-time in Olympic equestrian medals. You can watch 2012 Olympic equestrian events live online beginning on Saturday, July 28 at 5am ET. In the 2012 Olympic Games in London, watch for Germany to try and reassert itself as the best nation when it comes to equestrian competitions. Germany has won seven straight gold medals in team dressage, while also winning the gold in team and individual eventing in the Beijing Olympics. You’ll want to be sure to watch Olympic equestrian events live online for free to see if Germany can maintain its dominance in these competitions. Big names to watch out for when Olympic equestrian competitions begin are Great Britain’s Zara Phillips (eventing team competition), who is the granddaughter of Queen Elizabeth II, Canadian showjumper Ian Miller, who is making his Olympic-record 10th appearance, Ireland’s Cian O’Connor, who had his 2004 equestrian gold medal taken away from him after his horse failed a doping test. US Olympic Equestrian Team member and two-time gold medalist Phillip Dutton is also another name to watch out for as he participates in his fifth Olympic Games, along with Beezie Madden, who won team gold medals in 2004 in jumping. Watch Olympic equestrian competitions live online for free to find out how the US performs. FreeCast’s Live Streaming Coverage Guide for the 2012 Olympic Games will give you the ability to watch Olympic equestrian competitions and all of your favorite Olympic sports live online, and it’s all free. Start watching Olympic equestrian competitions live online for free beginning at 5am ET on Saturday, July 28. Individual Dressage (Grand Prix Freestyle) Preview – Thursday, August 9: Some names to look out for in the Individual Dressage Grand Prix Freestyle Final are reigning Olympic champion Anky van Grunsven of the Netherlands, USA’s Steffen Peters and Germany’s Helen Langehanenberg and Kristina Sprehe. There’s a good chance that three of these names will reach the podium on Thursday. The Individual Dressage Final starts at 7:30am ET. Individual Jumping Preview – Wednesday, August 8: It was Canada’s Eric Lamaze who won the Olympic gold medal in Individual Jumping at the Beijing Games and he’ll be looking for more Olympic hardware in London. Individual Jumping gets underway at 7am ET and will conclude with the Final Jump-Off at 10:55am ET. Other names to watch for are Sweden’s Rolf-Goran Bengtsson, who won the silver in Beijing and USA’s Beezie Madden, who won the bronze at the 2008 Games and is competing in her third-consecutive Olympics. Individual/Team Dressage Grand Prix Preview – Tuesday, August 7: In Individual Dressage, look for the Netherlands’ Anky van Grunsven to try and win his fourth consecutive gold medal to reassure everyone that he the competition belongs to him. Look for Germany’s Anabel Balkenhol, Kristina Sprehe, Helen Langehanenberg and Dorothee Schneider to be among the competitors that will give Anky a run for her money. Medals will be handed out at the conclusion of Tuesday’s team Dressage Grand Prix Special and among the favorites to receive them are Germany, the Netherlands and Great Britain, who comes in with the No. 1-ranked team. Germany has won the Olympic event seven straight times coming in, so be sure to watch Team Dressage live online to see if it’s another country’s turn to take the top spot on the podium. Both the team and individual dressage events will kick off at 5am ET. Individual/Team Jumping Preview – Saturday, August 4: In the Individual Jumping Qualifying, Canada’s Eric Lamaze will look to defend his Olympic gold medal from Beijing, while 2008 Games silver medalist Rolf-Goran Bengtsson (Sweden) is aiming for the top spot at the Olympic Games this time around. The US’ best shot at a medal will likely be through a strong performance from Beezie Madden. Meanwhile, US is going for its third-consecutive gold medal in Team Jumping as they compete in the qualifying round on Saturday. Switzerland and Germany are among the solid teams that could lessen the US’ chances of a three-peat. Both the Individual and Team Jumping qualifying will begin at 5:30am ET. Individual /Team Dressage Preview (Day 2) – Friday, August 3: The Individual and Team Dressage competitions begin at 6am ET on Friday as Germany tries to remain dominant in Olympic Equestrian at the London Games. Names to look out for include the US’ Steffen Peters, who won bronze medal in team dressage back in the 1996 Games, the Netherlands’ Edward Gal and Germany’s Helen Langehanenberg. In day 2 of the Team Dressage competition, expect Germany and the Netherlands to make strong pushes for the top two spots on the podium, while Denmark, Spain, or the US could also squeeze their way in there. Individual /Team Dressage Preview – Thursday, August 2: Look for two-time defending Olympic champion Anky Grunsven from the Netherlands to go for her third straight gold medal in the individual dressage event as she faces competition from the likes of Germany’s Dorothee Schneider and fellow Netherlands team member Patrick van der Meer. The individual and team dressage competitions start at 6am ET. Look for Michael Jung to try and lead Germany toward Olympic gold, while facing serious competition from a William Fox-Pitt-led Great Britain in the team dressage. Denmark is also considered to be in the running. Equestrian Preview – Tuesday, July 31: The mixed team and individual eventing finals for jumping will take place on Tuesday beginning at 5:30am ET. Germany is currently in first in team eventing after a strong performance on Monday, ahead of Great Britain (2nd), Sweden (3rd), New Zealand (4th) and the US (5th). Ingrid Klimke moved back into first in individual eventing, while Sweden’s Sara Algotsson Ostholt is in second and defending champion Michael Jung, also of Germany, is in third. New Zealand’s two-time gold medalist Mark Todd is in fourth. Watch the mixed team and individual eventing finals for jumping live online for free on Tuesday when Olympic equestrian picks back up. 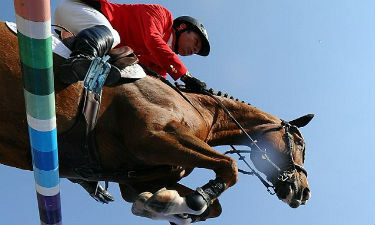 Individual Eventing: Great Britain’s equestrian team features many of the best event riders in the world, including No. 1-ranked William Fox-Pitt, who is the gold medal favorite in individual eventing, and Zara Phillips, the granddaughter of Queen Elizabeth, who will likely steal much of the spotlight. Defending gold medalist Hinrich Romeike of Germany is also likely to reach the podium again, while the US’ Phillip Dutton and Karen O’Connor are other big names to keep an eye on. Team Eventing: Germany, the defending gold medalist for team eventing, has a great chance at repeating in the 2012 Olympic Games. To do this, however, they will have to get past Great Britain, Australia and Holland, who are all known for having solid eventing teams.